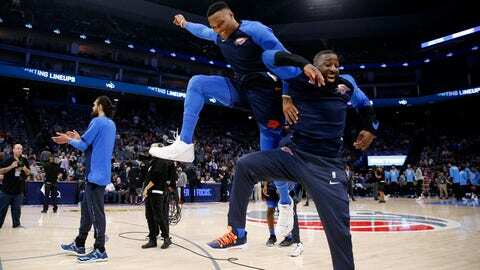 OAKLAND, Calif. — Two teams that have made more news off the court than on it the past week go head-to-head Wednesday night when the Oklahoma City Thunder visits the Golden State Warriors. The Warriors will be playing for the fifth time since Draymond Green and Kevin Durant argued over a last-second play against the Los Angeles Clippers, with Green getting suspended for one game for taking his locker room tirade what was deemed to be a bit too far. The Warriors have not responded well to the incident. After a home win over the Atlanta Hawks the next night, Golden State got swept by Houston, Dallas and San Antonio on a four-day Texas trip that ended Sunday. The Warriors open a four-game home stand Wednesday, and were hoping the two day off leading into the game would allow their situation to calm down. It didn’t. Durant found out Tuesday he’d been fined $25,000 for yelling at a fan in Dallas; Green has been unable to shake a toe injury that will sideline him Wednesday for a third straight game; and Warriors coach Steve Kerr indicated to reporters Tuesday that Stephen Curry, who already has missed six games in a row, likely will be sidelined the entire home stand with a groin injury. “This is a difficult stretch,” Kerr assured the assembled media Tuesday. “The biggest thing is getting through these injuries. That’ll give us a chance to redevelop our confidence, our rhythm and our timing. The Thunder has fought the Warriors about as tough as any team in recent years, including this season, when they battled Golden State to the wire on opening night even without star Russell Westbrook in a 108-100 loss. Of course, any Thunder-Warriors matchup rekindles memories of Durant leaving Oklahoma City as a free agent and Westbrook not taking kindly to the move. But given recent events — including Westbrook missing six straight games due to a combination of a sprained ankle and attending the birth of twin daughters — there’s less talk about lingering bad feelings on the eve of Wednesday’s duel than any other in the past two seasons. Westbrook returned to the team for Monday’s 117-113 loss at Sacramento. He had 29 points, 13 rebounds, seven assists and three steals in 37 minutes, but got precious little support from teammates who combined to shoot 33-for-83 (40 percent). The Warriors and Thunder have met nine times since Durant changed teams, with Durant and Westbrook each missing one game. Golden State has won seven of the nine. Durant has outscored Westbrook 229-221 in their seven head-to-heads, with the winner of the individual matchup leading his team to a victory on five of the seven occasions.